With so many things happening in Sacramento these days, it’s hard to keep up with all the new restaurant openings. 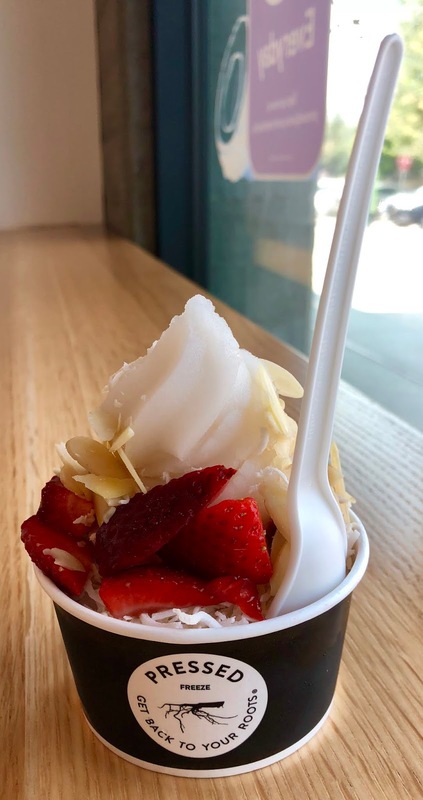 Case in point: if I hadn’t been scrolling through my Instagram feed the other day, who knows when I might have found out about Pressed Juicery, which opened in the Ice Blocks building last December. As the name suggests, Pressed Juicery offers a variety of cold-pressed juices. They have juices made with greens, roots, citrus, or fruit. They have juice shots, refreshers, cleanses, tonics, and premium waters. They even have lattes made with vanilla almond milk. But what caught my attention on Instagram was a photo of one of their dairy-free, soft-serve freezes. Since it was a hot day, as they have all been lately, I drove right over to get one. 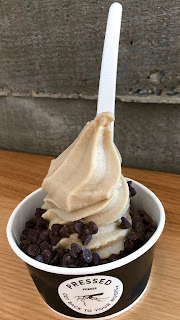 The one I wanted was the one I saw in the Instagram photo – a vanilla freeze made from water, dates, almonds, vanilla extract, and sea salt, then topped with semisweet chocolate chips. It was the perfect mid-afternoon snack! It was so good, in fact, that I went back the next afternoon to try a different flavor. This time, I got the creamy coconut freeze, made with water, pineapple, coconut, vanilla extract, and sea salt, and I had it topped with shredded coconut, shaved almonds, and strawberries. So good! 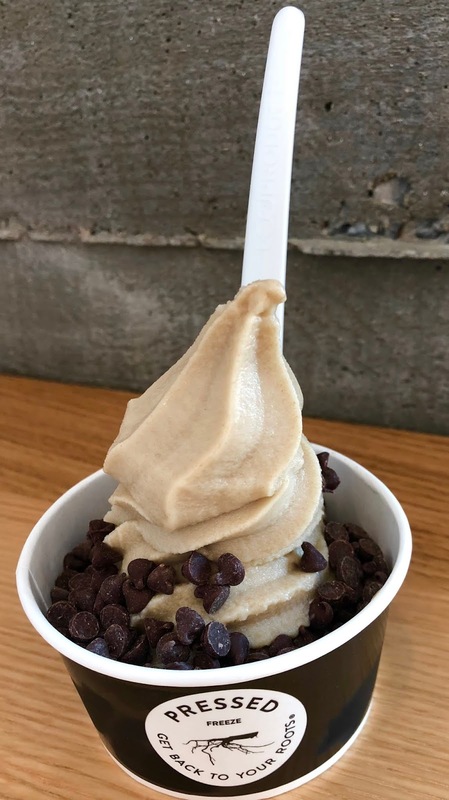 Everything at Pressed Juicery appears to be vegan, with the following exceptions: honey (an optional topping for the freezes), granola (another optional topping, which contains honey), and the charcoal lemonade, which also contains honey. Pressed Juicery is a chain restaurant. The address of its Sacramento location is 1710 R Street, Suite 170, and their phone number is 916-497-0702. Their website address is https://www.pressedjuicery.com/, and their Facebook page can be found at https://www.facebook.com/Pressed-Juicery-1999517573621113/?ref=br_rs. Pressed Juicery is open Monday through Thursday from 7:00 a.m. to 8:00 p.m., Friday and Saturday from 8:00 a.m. to 9:00 p.m., and Sunday from 8:00 a.m. to 8:00 p.m.